My wife Marci and I saw Sar-Ko-Par Trails Park last night. It is all lit up with its finest Christmas lights all around the park. It was, and is, beautiful. 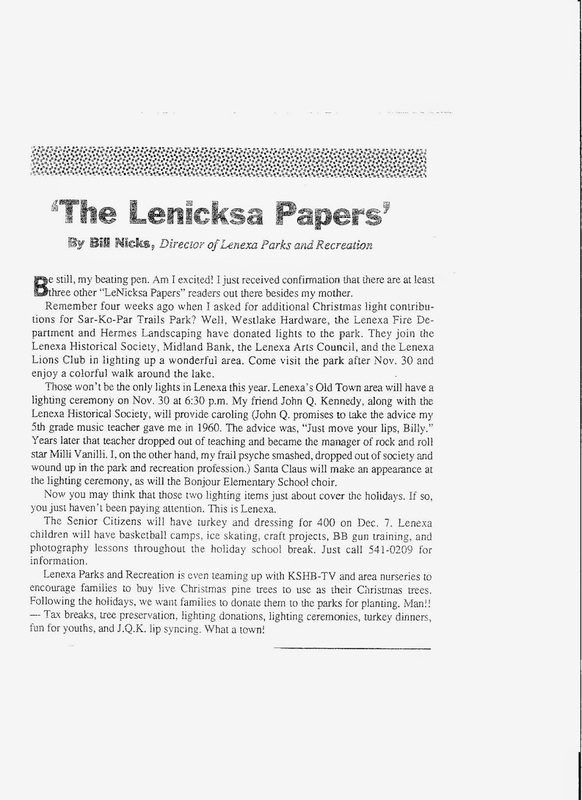 A true treasure for Lenexa KS residents and all the visitors who stop-in this time of year. The lights reminded me of an article I wrote in the 80s thanking those who first donated money and lights to decorate the park. It is good to see that the tradition continues and has grown to the wonderful display that covers 15 acres of the 53 acre park. Very nice. Thank you. That 80s article is attached so that we can all remember, and perhaps thank once again, those who started it. Merry Christmas.